Objective Th17 cells are a subset of CD4+ T-helper cells characterised by interleukin 17 (IL-17) production, a cytokine that plays a crucial role in inflammation-associated diseases. The cyclic AMP-responsive element modulator-α (CREMα) is a central mediator of T-cell pathogenesis, which contributes to increased IL-17 expression in patients with autoimmune disorders. Since an increased Th17 response is associated with a poor prognosis in patients with chronic liver injury, we investigated the relevance of Th17 cells for chronic liver disease (CLD) and hepatocarcinogenesis. Design Transgenic mice overexpressing CREMα were crossed with hepatocyte-specific Nemo knockout mice (NemoΔhepa) to generate NemoΔhepa/CREMαTg mice. The impact of CREMαTg on CLD progression was examined. Additionally, soft agar colony formation assays, in vitro studies, adoptive transfer of bone marrow-derived cells (BMDCs) and T cells, and gene arrays in T cells were performed. Results 8-week-old NemoΔhepa/CREMαTg mice presented significantly decreased transaminase levels, concomitant with reduced numbers of CD11b+ dendritic cells and CD8+ T cells. 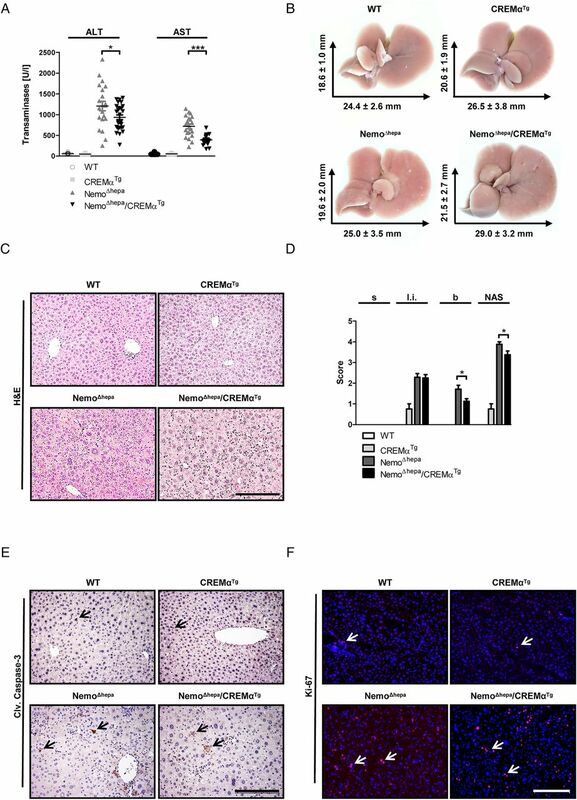 CREMαTg overexpression in NemoΔhepa mice was associated with significantly reduced hepatic fibrogenesis and carcinogenesis at 52 weeks. Interestingly, hepatic stellate cell-derived retinoic acid induced a regulatory T-cell (Treg) phenotype in CREMαTg hepatic T cells. Moreover, simultaneous adoptive transfer of BMDCs and T cells from CREMαTg into NemoΔhepa mice ameliorated markers of liver injury and hepatitis. Conclusions Our results demonstrate that overexpression of CREMα in T cells changes the inflammatory milieu, attenuating initiation and progression of CLD. Unexpectedly, our study indicates that CREMα transgenic T cells shift chronic inflammation in NemoΔhepa livers towards a protective Treg response. Th17 cells are involved in the pathogenesis of different types of liver injury. Th17 cells are associated with a poor prognosis in hepatocellular carcinoma (HCC) patients. Mice overexpressing cyclic AMP-responsive element modulator α (CREMα) in T cells are characterised by enhanced production of interleukin 17 (IL-17), IL-21 and IL-22 as well as retinoid receptor-related orphan receptor gamma-t (RORγT), and have increased inflammatory response. Overexpression of CREMα in T cells attenuates chronic liver disease and HCC development. CREMα overexpression changed the inhibitory profile of hepatic T cells. 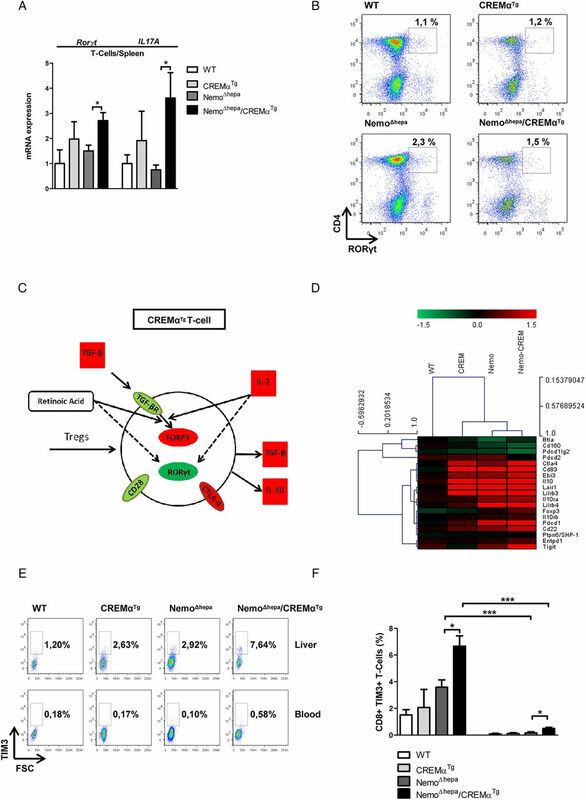 Hepatic stellate cell-derived retinoic acid induces the differentiation of CREMα transgenic T cells towards a protective regulatory T-cell (Treg) response. CREMαTg T cells primed with Treg conditions attenuate hepatocyte damage. To maintain a sufficient immune response, the timing and strength of immunosuppression have a major impact on inflammatory activity and end-stage cancer development. Therefore, our study demonstrates that the liver-specific inflammatory environment directs the response of regulatory T cells, which opens the basis for novel therapeutic strategies. Aberrant nuclear factor-κB signalling plays a fundamental role in a wide range of inflammation-mediated diseases including rheumatoid arthritis, asthma and human cancers such as Hodgkin's lymphoma and colitis-associated cancer.8 Knockout mice for the IKK complex members, IKKβ or NEMO, die in utero as a result of tumor necrosis factor (TNF)-mediated cell death of hepatocytes. Moreover, we have recently shown that hepatocyte-specific Nemo knockout (NemoΔhepa) mice are viable but develop chronic liver injury characterised by TNF-dependent inflammation and scar formation leading to liver fibrosis, hepatitis and HCC within 1 year of age.9 Hence, disease progression in this experimental animal model mimics the progression of human CLD. 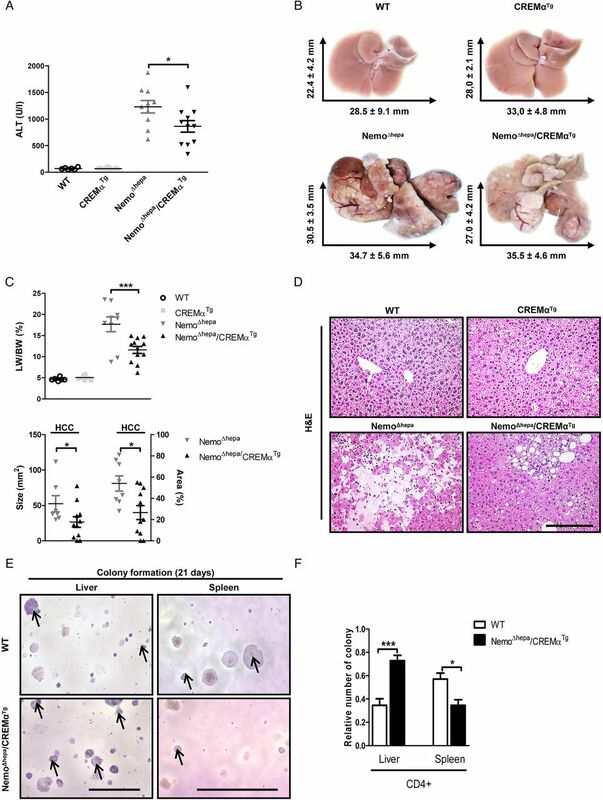 In the current study we hypothesised that an increased Th17 response, caused by overexpression of CREMα, would exacerbate liver injury in NemoΔhepa mice. However, we found ameliorated liver injury and reduced carcinogenesis. We, thus, analysed the underlying changes in disease progression and T-cell differentiation. Hepatocyte-specific IKK/Nemo knockout mice (NemoΔhepa)10 were crossed to CD2-CREMα transgene-expressing mice (CREMαTg mice) to generate NemoΔhepa/CREMαTg mice. CREMαTg mice were crossed to non-CREMαTg littermates for four generations. Cre littermates served as controls. Animals were housed under specific pathogen-free conditions in the animal facility of University Hospital Rheinisch-Westfälische Technische Hochschule (RWTH) Aachen. To investigate disease progression, male mice were sacrificed at 8, 13 and 52 weeks. All experiments were in line with the criteria of the authority for environment conservation and consumer protection of the state North Rhine-Westphalia (LANUV, Germany). For details on methodology, please see online supplementary material. Since earlier studies suggested that activated Th17 cells and Th17-related cytokines play a prominent role in hepatic inflammation in human liver disease, we studied the impact of Th17 cells on initiation and progression of CLD. Therefore, we generated NemoΔhepa/CREMαTg animals by crossing NemoΔhepa with Tg mice overexpressing CREMα specifically in T cells (CREMαTg) (see online supplementary figure S1A). To analyse the onset of CLD, we first assessed liver injury in 8-week-old mice. NemoΔhepa mice are characterised by high levels of serum alanine (ALT) and aspartate transaminases (AST). In contrast, NemoΔhepa/CREMαTg animals exhibited significantly reduced ALT and AST levels, indicating reduced liver injury in 8-week-old animals (figure 1A). 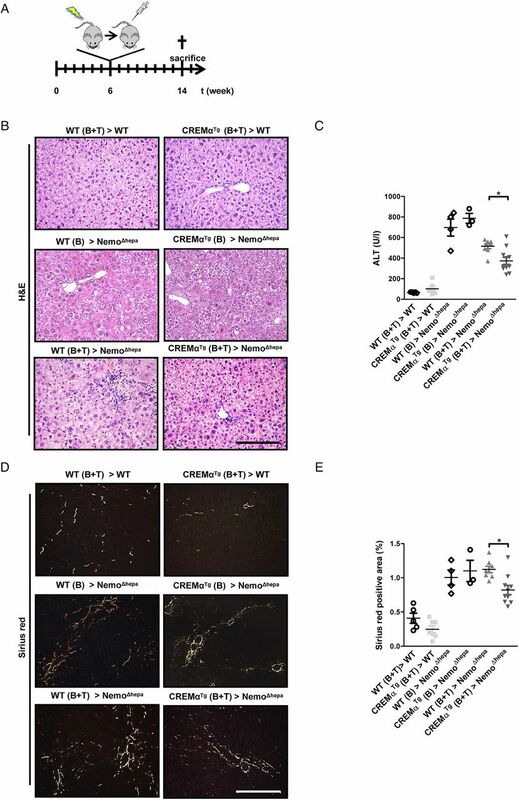 H&E staining revealed only mild differences in hepatic damage between NemoΔhepa/CREMαTg and NemoΔhepa mice (figure 1B, C), associated with a significantly decreased non-alcoholic fatty liver disease activity (NAS) score (figure 1D). CREMα ameliorates the onset of chronic liver disease in NemoΔhepa mice. (A) Serum ALT and serum AST levels (NemoΔhepa vs NemoΔhepa/CREMαTg). Data are shown as mean±SEM of n=21–28 mice per group (*p<0.05). (B) Macroscopic view of the livers as indicated. (C) Microscopic picture of H&E staining (scale bar: 200 µm). (D) Histological scoring of H&E-stained paraffin samples concerning steatosis (s), lobular inflammation (l.i. ), ballooning (b) and total non-alcoholic fatty liver disease activity score. Data are shown as mean±SEM of n=4–8 mice per group (*p<0.05). (E) Immunohistochemical staining for cleaved caspase-3 (scale bar: 200 µm). (F) Immunofluorescence staining for Ki-67 (red: Ki-67, blue: DAPI, scale bar: 200 µm). ALT, alanine aminotransferase; AST, aspartate aminotransferase; CREMα, cyclic AMP-responsive element modulator α; WT, wild type. The pathogenesis of CLD in NemoΔhepa mice is associated with increased hepatocyte apoptosis and compensatory proliferation.9 ,11 Thus, we analysed the effect of CREMα overexpression in T cells using markers of cell death and proliferation in NemoΔhepa/CREMαTg livers. 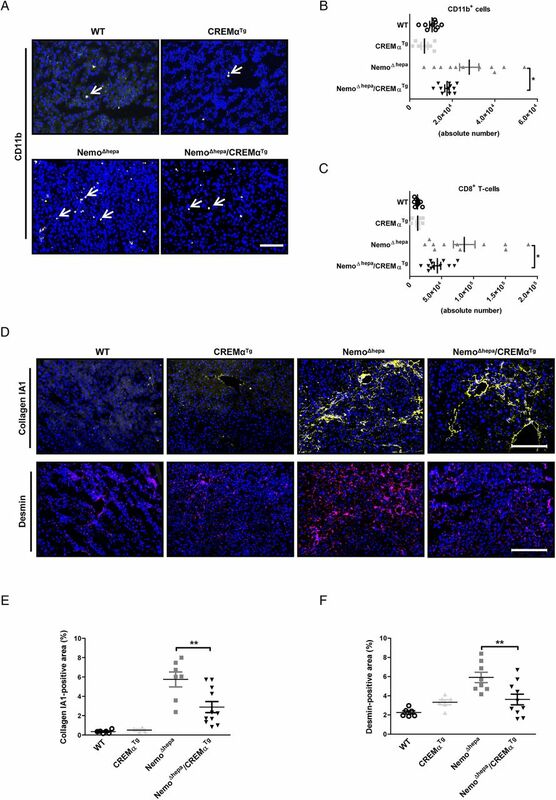 Immunostaining against cleaved caspase-3 (see figure 1E and online supplementary figure S1B) and Ki-67 (see figure 1F and online supplementary figure S1C) did not show any difference in apoptosis or compensatory proliferation in 8-week-old mice. Additionally, gene expression analysis revealed no significant difference in the expression of the proapoptotic proteins Bak or Bim, with exception of Bax, a proapoptotic protein that is activated by cleavage of caspases, significantly highly expressed in NemoΔhepa in contrast with NemoΔhepa/CREMαTg livers (see online supplementary figure S1D). In accordance, gene expression of the antiapoptotic proteins Bcl-2 or Bcl-XL was not altered in NemoΔhepa compared with NemoΔhepa/CREMαTg livers (see online supplementary figure S1D). However, the mRNA expression of proliferating cell nuclear antigen (Pcna), a specific S-phase cell-cycle marker,12 was significantly decreased in 8-week-old NemoΔhepa/CREMαTg compared with NemoΔhepa livers (see online supplementary figure S1E). Altogether, these results suggest that overexpression of CREMα in T cells improves the onset of CLD in NEMOΔhepa mice. Inflammatory responses upon liver injury comprise resident as well as infiltrating immune cells. Both the innate and the adaptive immune system are important triggers of liver inflammation. Therefore, we examined the amount and the composition of infiltrating immune cells by fluorescence-activated cell sorting (FACS) analysis and immunofluorescence staining. Eight-week-old NemoΔhepa/CREMαTg compared with NemoΔhepa livers revealed reduced numbers of CD11b+ dendritic cells (DCs) and CD8+ T cells (see figure 2A–C and online supplementary figure S2A). Moreover, immune cell populations such as granulocytes (see online supplementary figure S2A, B), inflammatory monocytes (see online supplementary figure S2A–D), CD4+ T cells (see online supplementary figure S3A, B) and natural killer T (NKT) cells (see online supplementary figure S3A, C) were decreased in NemoΔhepa/CREMαTg livers, while B cells were enhanced compared with NemoΔhepa animals (see online supplementary figure S3A, D). Overexpression of CREMα in T cells reduces hepatic inflammation in NEMOΔhepa mice. (A) Immunofluorescence staining for CD11b (yellow: CD11b, blue: DAPI, scale bar: 100 µm). Fluorescence-activated cell sorting analysis of infiltrating cells: Absolute number of (B) CD11b+ DCs; (C) CD8+ T cells; and (D) immunofluorescence staining for Collagen IA1 (yellow: Collagen IA1, blue: DAPI, scale bar: 200 µm). Immunofluorescence staining for desmin (red: Desmin, blue: DAPI, scale bar: 200 µm). (E)+(F) Quantification of collagen and desmin-positive area (NemoΔhepa vs NemoΔhepa/CREMαTg). Data are shown as mean±SEM of n=6–10 mice per group (*p<0.05, **p<0.01). CREMα, cyclic AMP-responsive element modulator α; WT, wild type. Since chronic liver inflammation triggers liver fibrogenesis, we studied changes in hepatic collagen deposition and desmin expression as markers of hepatic stellate cell (HSC) activation. Collagen IA1 and desmin immunofluorescence and quantification and Sirius red staining (not shown) revealed significantly decreased markers of hepatic fibrogenesis in livers of 13-week-old NemoΔhepa/CREMαTg compared with NemoΔhepa mice (figure 2D–F). Thus, overexpression of CREMα in T cells exerts an antifibrogenic effect by reducing the inflammatory milieu and extracellular matrix deposition in NemoΔhepa livers. NemoΔhepa mice spontaneously develop HCC within 1 year.9 Therefore, we next focused on studying the impact of CREMα overexpression in T cells on tumour initiation and progression. ALT levels were significantly reduced in 52-week-old NemoΔhepa/CREMαTg compared with NemoΔhepa mice (figure 3A). Macroscopic liver examination revealed solid tumours in both NemoΔhepa and NemoΔhepa/CREMαTg mice (figure 3B). However, HCC was found in 100% of NemoΔhepa mice, whereas it was detected in only 80% of NemoΔhepa/CREMαTg mice (see figure 3C; lower panel and online supplementary figure S4A). Furthermore, the liver-to-body weight ratio was significantly reduced in NemoΔhepa/CREMαTg compared with NemoΔhepa mice, respectively (figure 3C; upper panel). NemoΔhepa/CREMαTg mice display reduced carcinogenesis. (A) Serum aspartate aminotransferase levels (NemoΔhepa vs NemoΔhepa/CREMαTg). Data are shown as mean±SEM of n=6–12 mice per group (*p<0.05). (B) Liver pictures and average liver size. (C, upper panel) Liver versus body weight (LW/BW) ratio (NemoΔhepa vs NemoΔhepa/CREMαTg). Data are shown as mean±SEM of n=6–12 mice per group (***p<0.001). (C, lower panel) Quantification of absolute and relative area of HCC. Data are shown as mean±SEM of n=8–11 mice per group (*p<0.05). (D) Macroscopic picture of H&E staining (scale bar: 200 µm). (E) Soft agar colony formation assays were performed in Hepa 1–6 challenged with CD4+ T cells isolated from spleen and liver of WT and NemoΔhepa/CREMαTg mice. After 21 days of incubation, colonies were stained with 0.01% crystal violet (scale bar: 1 and 5 mm). (F) The number of colonies was counted and shown in a graphic presentation of the soft agar colony formation assays of mean±SEM of triplicated experiments (***p<0.001). ALT, alanine aminotransferase; CREMα, cyclic AMP-responsive element modulator α; HCC, hepatocellular carcinoma; WT, wild type. Interestingly, the absolute as well as the relative area of HCC were significantly increased in NemoΔhepa compared with NemoΔhepa/CREMαTg mice (see figure 3C; lower panel and online supplementary figure S4B). Both CD4+ and CD8+ T cells are mostly considered to be significant players in inhibiting, impeding and killing tumour cells. Moreover, it has been recently shown that loss of CD4+ T cells promotes HCC development.13 To evaluate the immunosuppressive effect of cyclic AMP-responsive element modulator-α (CREMα)Tg-overexpressing CD4+ T cells, we challenged Hepa 1–6 cells, a HCC cell line, with isolated splenic and hepatic CD4+ T cells from wild type (WT) and NemoΔhepa/CREMαTg mice by testing its ability to form anchorage-independent colonies. As control, we used tumour cell clones that grow in soft agar. Surprisingly, CD4+ T cells derived from a NemoΔhepa/CREMαTg environment augmented the transformation potential of the HCC cell line. Conversely, splenic CD4+ T cells isolated from NemoΔhepa/CREMαTg mice, but with a CREMαTg phenotype, significantly reduced the tumourigenic capacity of Hepa 1–6 cells (see figure 3E, F and online supplementary figure S4C). These results question whether CD4+ T cells exert a crucial role in tumour development in NemoΔhepa/CREMαTg or decreased carcinogenesis is a secondary effect of the reduced inflammation observed in these livers. Since 1-year NemoΔhepa/CREMαTg livers showed less HCC, and the impact of CREMα overexpression in T cells for tumour growth or malignant transformation and proliferation was further investigated in 52-week-old livers. Immunoblotting for PCNA, cyclin A and pRb revealed decreased protein expression of these proliferation markers in NemoΔhepa/CREMαTg compared with NemoΔhepa livers (figure 4A). These data were confirmed by reduced Ki-67 immunostaining in liver tissue of NemoΔhepa/CREMαTg mice (figure 4B). Overexpression of CREMα in T cells reduces tumour malignancy in NEMOΔhepa mice. (A) Western blot using liver protein for PCNA, Cyclin A, pRb and GAPDH. (B) Immunofluorescence staining for Ki-67 (red: Ki-67, blue: DAPI, scale bar: 200 µm) and quantification of Ki-67-positive cells (NemoΔhepa vs NemoΔhepa/CREMαTg). Data are shown as mean±SEM of n=5–11 mice per group (*p<0.05). (C) mRNA expression for c-myc (NemoΔhepa vs NemoΔhepa/CREMαTg). Data are shown as mean±SEM of n=6–11 mice per group (**p<0.01). (D) Western blot from liver protein for glutamine synthetase and GAPDH. CREMα, cyclic AMP-responsive element modulator α;DAPI, 4', 6-diamidino-2-phenylindole; GAPDH, glyceraldehyde 3-phosphate dehydrogenase; PCNA, proliferating cell nuclear antigen; WT, wild type. To characterise changes in the molecular signature of HCC derived from NemoΔhepa/CREMαTg and NemoΔhepa animals, we next investigated c-myc expression, a transcription factor associated with the conversion of preneoplastic liver lesions into HCC.14 ,15 mRNA expression of c-myc was significantly reduced in NemoΔhepa/CREMαTg mice compared with NemoΔhepa mice (figure 4C). Additionally, western blot as well as immunostaining against glutamine synthetase, an enzyme shown to be upregulated in human and murine HCC tissue,16 were enhanced in NemoΔhepa compared with NemoΔhepa/CREMαTg mice (see figure 4D and online supplementary figure S4D). Altogether, these results suggest that Tg overexpression of CREMα in T cells exerts a beneficial effect on tumour progression. First, we excluded a direct effect of CREMαTg T cells on hepatocyte physiology. Therefore, we stimulated primary hepatocytes of WT, CREMαTg, NemoΔhepa and NemoΔhepa/CREMαTg mice for 6 h with TNF-α (10 ng/mL). In line with previous observations, Nemo-deficient hepatocytes were hypersensitive to TNF-α,10 whereas WT hepatocytes were resistant (see online supplementary figure S5A, C). However, there was no difference in sensitivity towards TNF-α between NemoΔhepa and NemoΔhepa/CREMαTg hepatocytes. To further validate the effect of CREMαTg T cells on NemoΔhepa hepatocytes, we stimulated primary isolated hepatocytes from WT and NemoΔhepa mice with supernatant (SN) of unprimed (Th0) or Treg primed conditions (transforming growth factor (TGF)-β, TGF-β+retinoic acid (RA) or SN of activated HSC (7d) from WT or CREMαTg T cells). Interestingly, we found that stimulation of WT hepatocytes with these conditions did not influence their survival (see online supplementary figure S5B, D). However, challenge of NemoΔhepa hepatocytes with Th0 CREMαTg T cells SN increased ALT levels, whereas priming with T-cell SN—causing their differentiation towards a regulatory T-cell (Treg) phenotype—significantly ameliorated the levels of transaminases in NemoΔhepa hepatocytes (see online supplementary figure S5B,D). Altogether these results indicate that CREMαTg Treg attenuate NemoΔhepa-derived hepatocyte damage. Consequently, we investigated whether amelioration of CLD progression was caused by haematopoietic cells, and, especially, T cells. We, thus, performed adoptive transfer experiments. Six-week-old recipient mice were irradiated and transplanted with bone marrow-derived cells (BMDCs). In addition, these animals received a boost injection of T cells. As control, NemoΔhepa mice received either WT or CREMαTg BMDCs in order to verify the importance of the adoptive T-cell transfer. Mice were sacrificed 8 weeks later, and parameters of liver injury, hepatic inflammation and liver fibrosis were assessed, to analyse the impact of the transplanted cells (figure 5A). The simultaneous transfer of CREMαTg T cells and haematopoietic cells ameliorates liver injury in NemoΔhepa mice. (A) Outline of the transplantation experiment. WT or NemoΔhepa mice were either transplanted with WT or CREMαTg bone marrow cells (B) alone or in combination with T cells (B+T). (B) Microscopic picture of H&E staining (scale bar: 200 µm). (C) Serum alanine aminotransferase (ALT) levels (NemoΔhepa vs NemoΔhepa/CREMαTg). Data are shown as mean±SEM of n=5–11 mice per group (*p<0.05). (D) Immunohistochemical staining for Sirius red (scale bar: 200 µm). (E) Quantification of Sirius red-positive area (WT>NemoΔhepa vs CREMα>NemoΔhepa). Data are shown as mean±SEM of n=5–11 mice per group (*p<0.05). CREMα, cyclic AMP-responsive element modulator α; WT, wild type. Liver histology of transplanted mice revealed reduced liver damage in NemoΔhepa mice receiving CREMαTg cells, accompanied by significantly lower serum ALT values (figure 5B, C). This effect was more pronounced in animals that received BMDCs and T cells, indicating the crucial effect of pre-existing T cells. Furthermore, NemoΔhepa mice receiving CREMα Tg cells displayed significantly reduced collagen deposition as evidenced by Sirius red staining (figure 5D, E). Thus, haematopoietic-derived CREMα Tg T cells are essential to confer protection against CLD progression in NEMOΔhepa mice. CREMα-overexpressing mice display a Th17 phenotype, characterised by enhanced production of IL-17, a proinflammatory as well as a profibrotic cytokine,5 and manifest accelerated inflammatory response in in vivo models of contact dermatitis and acute lung injury. Surprisingly, NemoΔhepa/CREMαTg mice showed reduced CLD progression. We, thus, examined the mRNA transcripts of the lineage transcription factor of Th17 cells, Rorγt, and their signature cytokine, IL17A, in 8-week-old CREMαTg and NemoΔhepa/CREMαTg livers. Interestingly, T cells isolated from spleens of NemoΔhepa/CREMαTg mice showed a significant increase in Rorγt and IL17A mRNA expression (figure 6A). Overexpression of CREMα does not induce a predominant Th17 response in hepatic T cells. (A) qPCR for Rorγt and IL-17A in splenic T cells (WT vs CREMαTg, CREMαTg vs NemoΔhepa/CREMαTg, NemoΔhepa vs NemoΔhepa/CREMαTg). Data are shown as mean±SEM of n=2–5 mice per group (*p<0.05, **p<0.01). (B) Representative FACS dot plots for RORγt in hepatic leukocytes. Percentages shown are for only this representative FACS plot. (C) Results from N-counter analysis for the differentiation of hepatic T cells into regulatory T cell. (D) Heat map for coinhibitory T-cell epitopes (red: upregulated; green: downregulated). (E) Representative FACS plots for TIM3 in hepatic leukocytes. Percentages shown are for only this representative FACS plot. (F) Percentage of CD8+ TIM3+ T cells (NemoΔhepa vs NemoΔhepa/CREMαTg, NemoΔhepa vs NemoΔhepa, NemoΔhepa/CREMαTg vs NemoΔhepa/CREMαTg). Data are shown as mean±SEM of n=8–15 mice per group (*p<0.05, ***p<0.001). CREMα, cyclic AMP-responsive element modulator α; FACS, fluorescence-activated cell sorting; RORγt, retinoid receptor-related orphan receptor gamma-t; TIM3, T-cell immunoglobulin domain and mucin domain 3; Treg, regulatory T cell; WT, wild type. Since we observed major differences in the effect of CREMα Tg T cells on the NemoΔhepa phenotype, associated with their differentiation pattern,17 we further investigated the Th17 phenotype in hepatic T cells (figure 6B). Indeed, our FACS analysis revealed that CREMαTg control mice showed no increase in Rorγt+ T cells in the liver. In contrast, enhancement of Rorγt+ T cells was observed in NemoΔhepa livers compared with NemoΔhepa/CREMαTg livers (figure 6B), suggesting that CREMα overexpression does not induce a predominant Th17 response in hepatic T cells. As Th17 cells and Tregs develop through reciprocal pathways, we next investigated whether reduced Rorγt expression might be linked with an enhanced differentiation of hepatic T cells into the Treg lineage. NanoString Technology, a direct multiplexed measurement of gene expression in 8-week-old WT, CREMαTg, NemoΔhepa and NemoΔhepa/CREMαTg hepatic T cells, was performed. Thereby, we observed increased mRNA transcripts for forkhead-box-protein p3 (foxp3)—the lineage transcription factor of Tregs in hepatic T cells isolated from NemoΔhepa/CREMαTg mice (figure 6C, D). Additionally, several markers of Treg function such as cytotoxic T-lymphocyte-associated protein 4 (ctla4), an inhibitory receptor, as well as Epstein-Barr virus induced-3 (ebi3), which encodes the IL-27β subunit of IL-35—a cytokine that suppresses inflammatory responses of immune cells, were strongly induced in hepatic T cells of NemoΔhepa/CREMαTg mice (figure 6C, D). In line with these findings, the T-cell immunoreceptor with Ig and immunoreceptor tyrosine-based inhibition motif (ITIM) domains (tigit), which is able to induce IL-10 production by DCs18 and thereby mediate immune suppression, was strongly upregulated in hepatic T cells of NemoΔhepa/CREMαTg mice (figure 6D). Consistently, programmed cell death protein-1 (pdcd1), a surface receptor that prevents the activation of T cells by inhibiting Treg apoptosis, was also upregulated in hepatic T cells of NemoΔhepa/CREMαTg and NemoΔhepa mice (figure 6D). To confirm our findings on protein level and to address the question whether the observed changes were specific for hepatic T cells, we performed FACS analysis using antibodies against FOXP3, CTLA4 and T-cell immunoglobulin domain and mucin domain 3 (TIM3) and further included blood-derived T cells in our analysis. TIM3 is widely regarded as a negative regulator of effector T-cell function and exhaustion and additionally has been shown to enhance the suppressor function of Tregs.19 Our data showed a general increase in Treg-related markers (FOXP3, CTLA4 and TIM3) in hepatic T cells of 8-week-old NemoΔhepa/CREMαTg mice compared with blood-derived T cells (see figure 6E, F and online supplementary figure S7). Moreover, the bioinformatics analysis of gene arrays revealed that T cells isolated from CREMαTg livers display upregulation of the IL-4 and IL-2 signalling pathways, involved in T-cell activation and differentiation into Th1, Th2 and Treg. CREMα-overexpressing T cells express high mRNA levels of LIGHT and CD40L associated with T-cell activation (see online supplementary figure S6A). Interestingly, liver NemoΔhepa/CREMαTg T cells exhibit upregulation of the CX3CR/CX3CL1 signalling pathway, a protective pathway in liver injury,20 TREM2, which attenuates TLR4-dependent inflammation, and macrophage receptor with collagenous structure (MARCO), important in DCs (see online supplementary figure S6A). Furthermore, CREMαTg and NemoΔhepa/CREMαTg T cells show differential regulation of cytokine production by IL-17A and IL-17F (see online supplementary figure S6B). Altogether, our data suggest that the differentiation of T cells together with the activation of protective pathways such as the CX3CR/CX3CL1 confers protection against inflammation and tumourigenesis to NemoΔhepa/CREMαTg livers. After we observed reduced Rorγt+ T cells in the liver, we tested the hypothesis that the inflammatory milieu in NemoΔhepa livers might exert a direct effect on CREMα-expressing T cells. Based on previous publications5 and to further corroborate the specificity of our results, we included splenic T cells in our experiment. Several studies indicate that activated HSC, especially during inflammation, function to enhance Treg differentiation.21 In this scenario, an important soluble factor is RA; therefore, we analysed the mRNA expression of RA-related genes in WT and NemoΔhepa liver tissue. Indeed, we found upregulation of genes involved in RA metabolism including aldehyde dehydrogenase 1 family, member A1 (ALDH1A1), lecithin retinol acetyltransferase 1 (LRAT1), cellular RA binding protein 1 (CRABP1) and retinoc acid receptor (RAR)-α and RAR-β (figure 7A). 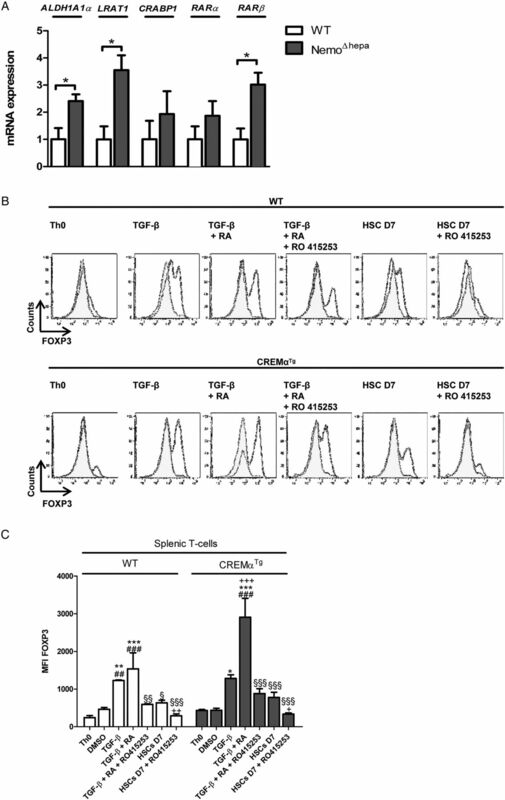 To investigate whether HSC-derived RA contributes to the increase in FOXP3 in CREMαTg mice, we isolated splenic T cells and cultured them with HSC SN and compared the differentiation pattern with T cells cultured under Th0 (without differentiation-inducing cytokines), Treg (TGF-β) or pronounced Treg (TGF-β+RA) conditions. The inflammatory milieu in NemoΔhepa livers induces FOXP3 expression in CREMα-overexpressing T cells. (A) mRNA expression for ALDH1A1, RARα, RARβ, LRAT1 and CRABP1 (WT vs NemoΔhepa). Data are shown as mean±SEM of n=4–10 mice per group (*p<0.05). Splenic CD4+ T cells were isolated and clonally expanded for 4 days using antibodies against CD3 and CD28 before staining. Additionally, cells were treated with medium (Th0), TGF-β (10 ng/mL), TGF-β (10 ng/mL)+RA (10 nM RA), TGF-β (10 ng/mL)+RA (10 nM)+RO 415253 (1 µM), supernatant of HCS and/or RO 415253 (1 µM). (B) Representative fluorescence-activated cell sorting histogram plots for FOXP3 expression. Filled histograms represent isotype control, and open histograms represent FoxP3 staining. (C) Histograms representing the mean fluorescence intensity of FOXP3. Data shown are the means from one representative experiment, which was repeated twice (##p<0.01, ###p<0.001 compared with Th0; *p<0.05, **p<0.01, ***p<0.001 compared with dimethyl sulfoxide (DMSO); +p<0.05, ++p<0.01 compared with TGF-β; §§ p<0.01, §§§p<0.001 compared with TGF-β+RA). CREMα, cyclic AMP-responsive element modulator α; HSC, hepatic stellate cell; RA, retinoic acid; WT, wild type. While CREMαTg T cells displayed a higher mean fluorescence intensity for FOXP3 under Th0 conditions—reflecting the amount of the bound antibody—stimulation with TGF-β or with TGF-β+RA strongly induced FOXP3 expression in WT and, dramatically, in CREMαTg T cells. Interestingly, challenge with HSC (7d) SN led to an increase of FOXP3 in both WT and CREMαTg T cells in contrast to quiescent HSC (4d) SN (see figure 7B, C and online supplementary figure S8A, B). To further evaluate the important role of RA in the TGF-β-dependent induction of FOXP3+ Treg and taking into account that the retinoic receptor (RAR)-α is involved in Treg induction,22 ,23 we used RO415253, a specific inhibitor of RAR-α. RAR-α inhibition reduced the expression of FOXP3 almost to the level of T cells under Th0 conditions. We observed this effect in both WT and CREMαTg T cells, suggesting a crucial role of RA in Treg induction (see figure 7B, C and online supplementary figure S8A, B). To determine whether increased amounts of Treg led to a reduction of other T-cell populations, we additionally assessed the production of signature cytokines IL-17 (Th17) and interferon γ (IFNγ) (Th1). While IL-17 levels showed no major differences under Th0 conditions, CREMαTg T cells exhibited increased levels of IL-17 upon treatment with TGF-β+IL-6. SN from quiescent and activated HSC reduced the expression of IL-17, in both WT and CREMαTg T cells (see online supplementary figure S9A, B). Regarding Th1 differentiation, CREMαTg T cells displayed slightly higher basal IFNγ levels, which were strongly diminished in both WT and CREMαTg T cells upon treatment with TGF-β+IL-6. Alike to IL-17, treatment with SN from quiescent and activated HSC strongly reduced the levels of IFNγ (see online supplementary figure S9A, C). Therefore, our data suggest a specific increase of FOXP3 expression and thus Treg expansion in CREMαTg T cells stimulated with SN of activated HSC highly dependent on RA. NemoΔhepa mice are characterised by the development of CLD, encompassing spontaneous hepatocyte apoptosis, compensatory proliferation, and finally leading to HCC development, a process where the strong inflammatory response plays a crucial role. In the current study, we aimed to investigate the impact of a stronger Th17 response, caused by overexpression of CREMα in T cells, on disease progression of NemoΔhepa-dependent CLD. In contrast to our working hypothesis, we found reduced liver injury, hepatic fibrogenesis and tumourigenesis. Our data suggest that alterations in the expression pattern of molecules related to inhibitory T-cell function are essential to provide protection against CLD in this model. CREMα-expressing T cells are characterised by the presence of a Th17 phenotype. In vitro, these cells show enhanced expression of the lineage transcription factor RORγt and the marker cytokines IL-17, IL-21 and IL-22. The present work provides evidence that the Th17 phenotype is altered upon hepatic injury. In accordance with previous publications,5 T cells isolated from spleens of CREMα-expressing mice showed increased mRNA expression of RORγt and IL-17. Unexpectedly, the expression of RORγt in hepatic T cells was significantly downregulated in NemoΔhepa/CREMαTg mice. Th17 cells contribute to tissue damage by secreting cytokines such as IL-17 and IL-22 during liver fibrosis.24 ,25 Th17 cells are not the only producers of IL-17, even though they represent the major source. Neutrophils, CD8+ T cells and natural killer (NK) cells can also secrete IL-17.26 ,27 Indeed, blockade of the IL-17 signalling has been shown to limit inflammation and subsequent hepatocyte damage in mice.28 Inversely, increased IL-17 signalling exacerbates CCl4 and bile duct ligation-induced liver fibrosis.29 In contrast, regulatory T cells have been shown to suppress Th17-mediated inflammation through IL-10 signalling and STAT3.30 ,31 Consequently, several studies have demonstrated that Tregs limit fibrosis development by suppressing excessive immune responses in the liver.32 ,33 Thus, the increased frequency of Tregs in NemoΔhepa/CREMαTg mice might be responsible for the reduced number of Th17 cells. The expression of CREMα under control of the CD2 promoter in mice has been shown to reduce the number and alter the composition of immune cells in the liver.17 Previous work in our laboratory34 has shown the beneficial effects of depleting NK and NKT cells in NemoΔhepa mice. In the same line of results, NemoΔhepa/CREMαTg animals display reduced amounts of NKT cells, and of proinflammatory macrophages, granulocytes, CD11b+ DCs and CD8+ T cells, suggesting an overall reduced inflammatory response. These results are reflected by the experiments found in 8-week-old NemoΔhepa/CREMαTg mice in comparison to NemoΔhepa animals, showing a less severe phenotype with decreased transaminase levels. In fact, BMDCs are responsible for the ameliorated liver injury and fibrogenesis in NemoΔhepa/CREMαTg mice. To functionally investigate our phenotype, we performed bone marrow transplantation in combination with an adoptive transfer of splenic T cells to boost the T-cell response. NemoΔhepa mice reconstituted with CREMα BMDCs displayed a significant reduction in markers of liver injury and hepatic fibrogenesis, indicating that haematopoietic cells provide the CREMα-protective effect. It is tempting to speculate that this effect might be due to the induction of Tregs, potent inhibitors of inflammation.35 However, more experiments need to be performed in order to address the definite role of CREMα in BMDCs, since in the current study, we focused on the role of the overexpression of CREMα in T cells. Regulatory T cells represent a CD4+ population, which regulates immune responses. Treg can be either generated in the thymus (nTregs) or alternatively in the periphery (iTregs) (eg, the liver).35 Importantly, Th17 cell and Treg development is a reciprocal process. Thus, the differentiation process of Th17 cells inhibits Treg differentiation and vice versa.27 ,30 ,31 ,36 ,37 Indeed, we found increased mRNA and protein levels of lineage transcription factors such as FOXP3 in NemoΔhepa/CREMαTg. Moreover, our data show increased CTLA4 mRNA and protein expression, a molecule that has been linked with Treg function.38 However, the induction of Treg-associated markers was characteristic for hepatic T cells but not blood-derived T cells. Interestingly, we were able to reproduce our findings in splenic T cells that were challenged with liver-derived soluble mediators. These intriguing results raised the question whether the inflammatory milieu in NemoΔhepa livers exerted a regulatory effect on T cells expressing CREMα. Several studies have indicated that inflammation-activated HSC enhances Treg differentiation through transdifferentiation into myofibroblasts. Concomitantly, our further functional analysis demonstrates that CREMα transgene expression increases the susceptibility of T cells for differentiation into Treg—during hepatic inflammation and HSC activation as shown by increased levels of FOXP3 in vivo and in vitro. Hence, the liver-specific inflammatory milieu has an impact in the status of T-cell differentiation. As the disease progresses from hepatitis to HCC in NEMOΔhepa mice, T cells, both CD4+ and CD8+, decrease in numbers with attenuated function and increased expression of inhibitory receptors during HCC. Increased frequencies of Treg, associated with tumour growth, poor prognosis and decreased survival rates, have been observed in patients with gastric and liver cancer.39–41 Several findings in our model suggested that the lack of a predominant Th17 phenotype of hepatic T cells in NemoΔhepa/CREMαTg mice attenuates tumour development in these mice. First, 1-year-old NemoΔhepa/CREMαTg animals display reduced tumourigenesis. Second, we show in culture that CREMαTg T cells primed with Treg conditions attenuate NemoΔhepa-derived hepatocyte damage. Interestingly, with the colony formation assay in vitro we showed that T cells alone do not exert an inhibitory effect on tumour development in NemoΔhepa/CREMαTg livers. Overall, our results suggest that reduced HCC development in vivo is a multifactorial process that requires the interaction between several cell types, thus resulting in a reduced inflammatory environment. Hence, the direct effect of T cells in vivo in this setting might be less crucial than the influence of a variety of factors including growth factors, cytokines and the interplay between T cells and other cell types that contribute to reduced carcinogenesis in NemoΔhepa/CREMαTg livers. To further dissect the crosstalk between CREMα-overexpressing T cells and NemoΔhepa mice, we evaluated the mechanisms by which soluble mediators are inducing the protective phenotype observed in NemoΔhepa/CREMαTg mice. Through our in vitro studies we demonstrate that RA-derived activated HSC induces Tregs in CREMαTg T cells, thereby contributing to reduced inflammatory milieu and, consequently, decreased HCC in NemoΔhepa/CREMαTg livers. In summary, the effect of the CREMα transgene alters the ratio between Th17 and regulatory T cells, exerting an anti-inflammatory and antitumourigenic effect in NemoΔhepa livers. Thus, our present study shows that molecular defined immunosuppression is able to modulate inflammation-induced cancers and thus opens the gate to develop regulatory T-cell-based therapies for CLD patients. The authors thank Jörg Bangen for providing SN of activated HSC as well as Christian Liedtke for critically reading the manuscript. Furthermore, we would like to extend our gratitude to Linda Hammerich and Daniela Kroy for helpful advice concerning FACS experiments. FJC is a Ramón y Cajal Researcher (RYC-2014-15242).
. Defective thymocyte proliferation and IL-2 production in transgenic mice expressing a dominant-negative form of CREB. Nature 1996;379:81–5.
. Expression of proliferating cell nuclear antigen (PCNA)/cyclin during the cell cycle. 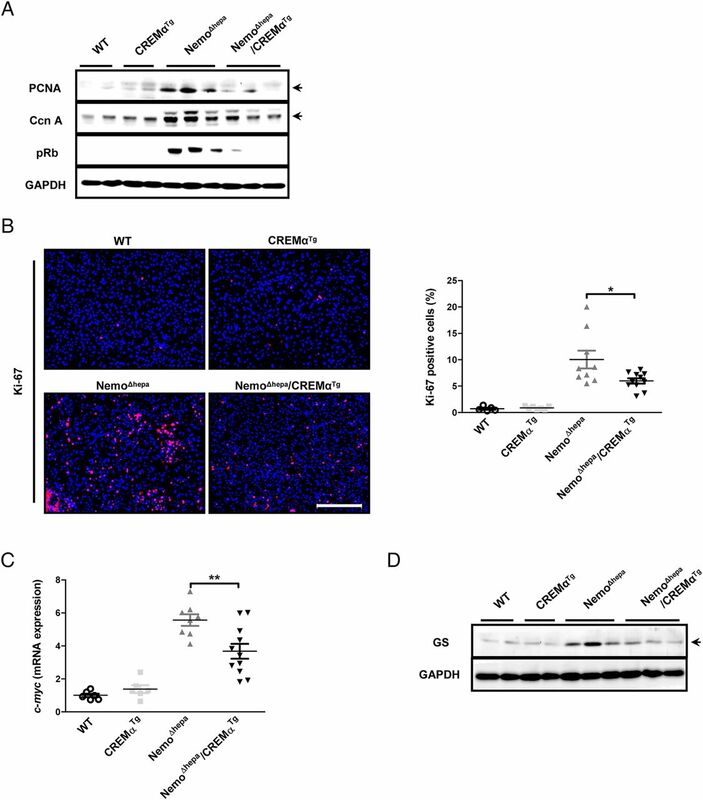 Exp Cell Res 1986;166:209–19.
. Overexpression of glutamine synthetase is associated with beta-catenin-mutations in mouse liver tumors during promotion of hepatocarcinogenesis by phenobarbital. Cancer Res 2002;62:5685–8.
. The surface protein TIGIT suppresses T cell activation by promoting the generation of mature immunoregulatory dendritic cells. Nat Immunol 2009;10:48–57.
. Interleukin-10 signaling in regulatory T cells is required for suppression of Th17 cell-mediated inflammation. Immunity 2011;34:566–78. NK and AM contributed equally. FJC and CT are joint senior authors. Contributors NK and AM: Experimental design, data acquisition, analysis and interpretation, drafting of the manuscript; KO, GH and TL: Data acquisition; KT: Experimental design; FJC: Data acquisition, analysis, study supervision, critical revision of the manuscript; drafting of the manuscript; CT: Experimental design, data interpretation, study supervision, drafting and critical revision of the manuscript. Funding This work was supported by the IZKF (UKA, RWTH Aachen), the SFB\TRR57 and the START-Program of the Faculty of Medicine (#691405, RWTH Aachen) DFG grant (TR 285/10-1). Author names in bold designate shared co-first authorship. Shall we blame CD4 T cells for everything?